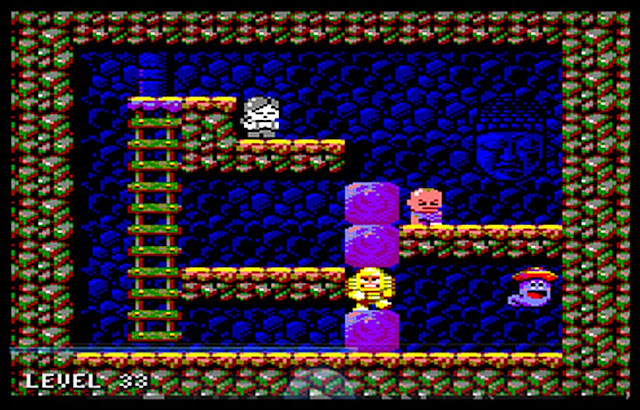 Baba's Palace - Charming in dev Amstrad game! As many of you know by now the #CPCRetroDev 2017 - Amstrad CPC Game Creation Contest will be finished on Friday, 10th of November with 29 games entered that hope to win and come home with a prize. One of those games in that listing is Baba's Palace by Rafael Castillo and John McKlain; a rather lovely looking Amstrad game, that doesn't just feature a great soundtrack, but charming graphics and fun for all the family gameplay. Re: Baba's Palace - Charming in dev Amstrad game! Is it possible to buy the game ? Is there a K7 or D7 version ? i'm stucked in level 24 raaaaaaaaaaaaaaaaaaaaaaaaaaahhh! I think RetroSpiel is planning to produce a physical edition eventually. I don't know if it will be available on cassette, disc, or both. This was fun until I hit level 24. ...and now that I've complained about it I solved it. Blah. It's really a great game ! Nah there's at least two of us. I'm tempted to make my own disc, but if the release is around the corner I'll just patiently wait for it. Well, better late than never: Congratulations to this excellent game Baba's Palace, Mr. Rafa​ Castillo, and Mr. John​ McKlain​ for the lovely music. Dedicated​ to​ all​ those​ who​ in​ their​ childhood​ were​ lucky​ enough​ to​ play​ video​ games​ on​ 8-bit machines,​ and​ could​ daydream​ with​ those​ prodigious​ pixelated​ graphics​ and​ hum​ those wonderful​ chiptune​ melodies. I'm honoured, and my whole family enjoys this nice game now. So that our children also learn the gems of retro CPC gaming. Greetings from Germany to Spain. Do we have a list of all level codes? Thank you 6128. That's great. Some news about the physical release ? I let this game running on my cpc during the last retrogaming connexion all saturday afternoon and many people enjoy it. Ah damn... perhaps someone else will pick it up? The game is far good enough to be manufactured by polyplay. Seriously, this game has a konami spirit, like goold old msx games. Indeed, hence why I was asking whether someone else might pick it up. Page created in 0.405 seconds with 98 queries.